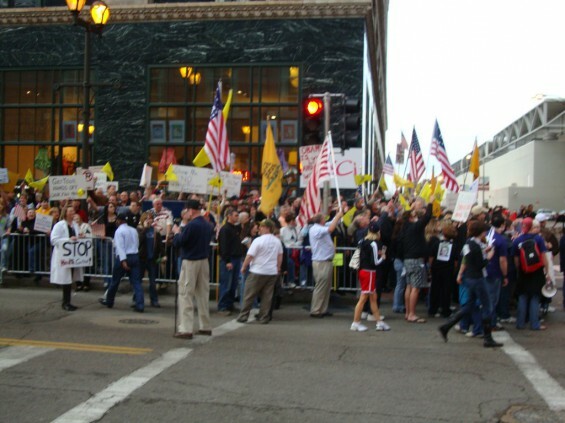 Thousands of Tea Party Patriots greeted Obama at his last fundraiser in St. Louis. We Will Meet Him Again. Tom Carnahan, brother of Robin and Russ Carnahan, was awarded $107 million of stimulus dollars for his Missouri windfarm. To show his appreciation, Carnahan will host a $25,000-per-person fundraiser for Obama next week. Jim Hoft (The Gateway Pundit) leads St. Louis Tea Party Coalition as it joins Americans for Prosperity, United for Missouri, and other organizations on Tuesday, October 4 to protest Stimulus Waste. Yes, the President will be here. Theme: Waste and Windmills. Solyndra. The Carnahan Family. This is NOT The After Party—this is a good, 2009-era street protest. You know just what to do. Parking: History Museum, Lagoon Dr. and Grand South of History Museum. Barack Obama will attend a $25,000-per person fundraiser at the home of Tom Carnahan on Lindell Blvd. St. Louis, MO on Tuesday, October 4, 2011. We’ll be there to greet him. For more information and directions go here. And remember.. Obama’s green agenda is not about saving the planet. It’s about control.